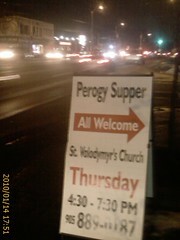 While I was driving down Yonge St. in Thornhill (just north of Toronto) this sign intrigued me. So naturally, I followed it! I pulled off the longest street in the world and headed down a quaint residential street to find the church at the end of the path. Every Thursday from 4:30-7:30 St. Volodymyr the Great Ukrainian Catholic Church at 15 Church Lane in Thornhill puts on a great dinner! I didn’t have a lot of time to take any pictures, but I got a great traditional Ukrainian meal (varenyky, kapusta and kovbasa with dessert and coffee) for only $8. I talked with some of the locals and the priest and hope to return sometime soon. Update: The traditional dinner’s timeslot has moved to every 2nd and 4th Friday of the month. It’s best to call in advance 905-889-0187 to be sure.